The story unfolds in a remote village near Palani called Kanakkanpatti with a poor goat-herd, Marimuthu……. ~ an illiterate, with no credentials, he also plays a game……….. he alongwith his childhood friends dream of winning a local tournament…. It was ‘Vennila Kabbadi Kuzhu’…… the titular kabbadi team, Vennilla, finds itself by chance in a State-level tournament and dramatically enter the finals ~ the end was pathos….. ~ a movie directed by Susindran in 2009 starring Vishnu Vishal, Kishore and Saranya Mohan along with numerous other newcomers in the lead roles – of whom Suri emerged bigger. It was later remade in Telugu as Bheemili Kabaddi Jattu in the year 2010. Kabbadi is a famous sport in rural India…. in our school days it was a very popular game… played between two teams – a raider goes in to the opposition half – the defenders try to catch him or restrain him from not touching the designated line… if he is caught, he is out and point lost… if he manages to come back – touching any of his opponents in the process, his team gains … the game title ‘Kabaddi’ reportedly derives it name from Tamil word meaning "holding of hand", which is indeed the crucial aspect of play. It is the national game of Bangladesh, and the state game of Tamil Nadu, Karnataka, Punjab and Andhra Pradesh in India.In the international team version of kabaddi, two teams of seven members each occupy opposite halves of a field of 10 m × 13 m. The raider has to hold his breath and chant without stop….. In the World Kabbadi Cup held in 2013 at Bathinda, India defeated arch rivals Pakistan to take the title. There have been complaints that Governments and Sports bodies nurture only Cricket and do not encourage other games…. Not in Chennai with Ms J Jayalalithaa as Chief Minister. Only recently Chennai was the venue for the FIDE World Chess championship matches – inaugurated at Nehru Indoor stadium by CM herself. Sad for us that reigning champion Viswanathan Anand (43) lost the title to Magnus Carlsen of Norway—nicknamed the "Mozart of Chess". Now comes the news of State Govt patronizing more sports. In a move to promote sports events in the state, Tamil Nadu Govt. has sanctioned Rs 1.75 crore towards conducting two world level events in Chennai. Ahead of the World Cup Kabaddi matches scheduled to take place here, Chief Minister J Jayalalithaa has allocated Rs one crore towards conducting the event in the state capital. Men and women players from 20 countries -- India, Mexico,USA, England, Japan, South Korea, Vietnam, Afghanistan, Nepal, Iran, Pakistan, Turkmenistan, Bangladesh, Thailand, Malaysia, Chinese Taipei, Australia, Canada, Italy and West Indies would participate in the event in the fourth week of February, an official release said. The government also allocated Rs 75 lakh towards conducting the 8th World University Squash Championships to be conducted in the state-of-the-art squash indoor stadium at Chennai, first ever such event to be held in Asia. 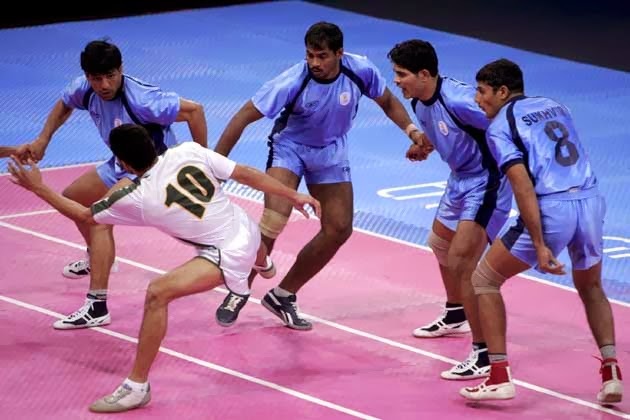 TOI reports that the 2014 kabaddi World Cup is likely to take place in the city in June. The third edition of the quadrennial event was initially scheduled for the fourth week of February, but with the state government clearance coming only on Thursday, the Tamil Nadu Amateur Kabaddi Association (TAKKA) authorities told TOI that now it has been pushed back to June. The event is to be held at the Jawaharlal Nehru Indoor Stadium in Chennai. Authorities stated that four playing arenas using mats inside the stadium will be set up to conduct matches simultaneously. Concluding with ‘Venilla Kabbadi Kuzhu’ – the scene that ticked people was Soori entering a parotta eating challenge ~ it earned him the nickname ‘parotta soori’ and you see lot him in many films now.